Be on alert for a new cough that lingers. 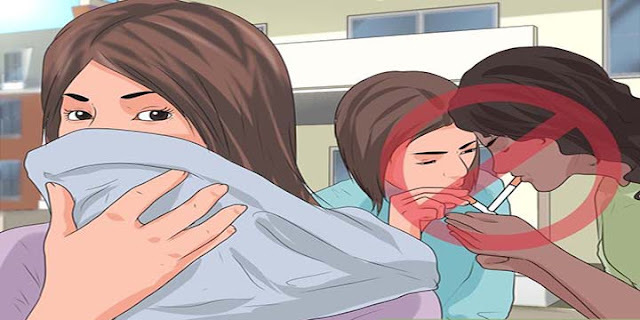 While a cough associated with a cold or respiratory infection will go away in a week or two, a persistent cough that lingers can be a possible sign of lung cancer. Don’t be tempted to dismiss a stubborn cough, whether it is dry or mucus-producing, as “just a cough.” See your doctor right away. He or she will listen to your lungs and may order an X-ray or other tests. Pay attention to any changes in a chronic cough, particularly if you are a smoker. If you are coughing more often, your cough has a deeper or hoarse sound, or you are coughing up blood or more mucus than usual, it’s time to make a doctor’s appointment. If a family member or friend experiences these changes, suggest that they visit their doctor. Shortness of breath or becoming easily winded are also possible symptoms of lung cancer. This symptom can occur if lung cancer blocks or narrows an airway, or if fluid from a lung tumor builds up in the chest. Make a point of noticing when you feel winded or short of breath. If this symptom occurs after climbing the stairs to your house, bringing in groceries, or performing another task you could previously do without finding it hard to breathe, don’t ignore it. If you hear a significant change in your voice, or if someone else points out that your voice sounds deeper, hoarse, or raspier, get checked out by your doctor. Hoarseness can be caused by a simple cold, but this symptom becomes worrisome when it hangs on for more than two weeks. Hoarseness related to lung cancer can occur when the tumor affects the nerve that controls the larynx, or voice box. An unexplained weight loss of 10 pounds or more may be associated with lung cancer or another type of cancer. When cancer is present, this weight drop may result from cancer cells using energy in the body. It could also result from shifts in the way the body uses food energy. Don’t write off a change in your weight if you haven’t been trying to shed pounds—it may be a clue to a change in your health. Chest X-rays are not effective in detecting early-stage lung cancer. However, low-dose computed tomography (CT) scans have been shown to reduce lung cancer mortality by 20 percent, according to a 2011 study. In the study, 53,454 people at high risk for lung cancer were randomly assigned either a low-dose CT scan or an X-ray. The low-dose CT scans detected more lung cancer. There were also significantly fewer deaths from the disease in the low-dose CT group. Talk with your doctor about whether low-dose CT screening is appropriate for you.